It’s June here in the Phoenix Valley, and that means we have entered full-blown summer desert temperatures. While a leisurely walk in the summer heat with your four-legged friend might seem harmless if proper precautions aren’t taken it could result in serious overheating for your pup. At Anasazi Animal Clinic, a local veterinary clinic in Gilbert AZ, we care dearly for your furry friends. For the sake of their health, we urge you to take the rising summer temperatures seriously. It’s best to keep your dog indoors for the majority of the day during the hot summer months and take it out for activity only when the sun isn’t high in the sky (or, try taking it for a nighttime stroll). But it may not be so easy to keep your pet indoors all day, especially if you have an energetic, large canine breed. So, if you do take your pet out during the hotter part of the day we recommend being aware of their physical needs and their physical health. If you suspect your pup has overheated, it’s important to bring their temperature down slowly. An ice cold bath would reduce their temperature too quickly causing complications. Instead, try one of these suggestions. Walk your dog in the early morning and evening hours. While mid-summer desert temperatures might still be warm at those times of day, the intensity of the sun won’t be as strong, and that will reduce the likelihood of overheating. No matter the time of day, always put your hand on the pavement before you bring your dog out. If you can’t hold it for at least five seconds, it’s too hot for your pet’s pads and could potentially burn their feet. Investing in a good pair of dog booties is also a great idea if their pads have to connect with hot concrete. Always provide fresh, cool water for your dog. The risk of dehydration in your canine friend is high in the Arizona summer heat. If your dog has to be outdoors for part of the day, make sure he has plenty of shade and lots of water. 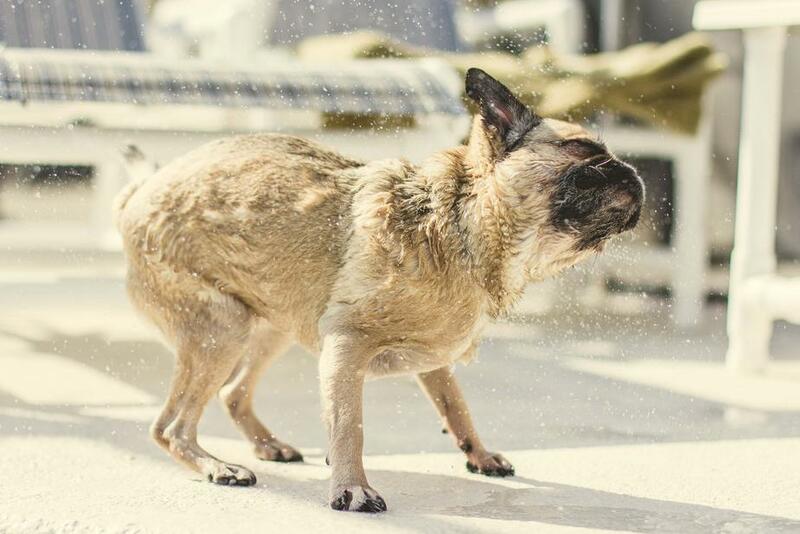 Cool your pet off with a hose or a child’s play pool. This is a fun treat for them that will help their body temperature stay cool. If you have a pool, swimming is a good activity that won’t overheat your dog. However, just as you would with children, always be present and watch your pet while they are in the water. Don’t hesitate to contact our team at Anasazi Animal Clinic if you have any concerns about summer care for your dog. In the event of overheating, the faster your pet gets attention, the better chance there is of helping him. As your local veterinary clinic in Gilbert AZ, we are here to help you keep your pet safe and healthy, especially during the hottest time of the year.